Russian linguist Alexei Mikheyev discusses 'siloviki', 'bespredel' and other Russian words that do not exist in English language but could come in handy. This word is gradually making its way into foreign languages already. In Russia, it came into wide use about 10 years ago, when political experts began talking about a growing rivalry between different factions within government power structures. Its usage generally rests on the theory that siloviki — influential figures in law enforcement and security agencies — compete with so-called liberals to define the country’s political priorities. The siloviki emphasize widely understood state interests (security, fighting crime, sovereignty), while liberals tend to focus on economic development and expanding civil liberties. This confrontation is not a purely Russian phenomenon and is, to varying degrees, present in many countries. In states with fragile democratic traditions, the heads of security forces (the army and police) occasionally lead coups. Nevertheless, the term siloviki as an umbrella term for this segment of state actors originated in Russian. The word can be used in two different ways: to denote the country as a whole (e.g. "to live in sovok") or as a human characteristic (e.g. "he is a hopeless sovok"). When used to describe people, sovok suggests an inert, passive, spiritless person who is completely dependent on the state and content with whatever they are given, which is not much. The era of the sovok is regarded as boring, dull and stagnant — it is not for nothing that the last 20 years of the Soviet Union are known as "the period of stagnation." The Sovok was characterized by an atmosphere of lies and hypocrisy in which official propaganda had little to do with real life. In order to avoid being socially sanctioned, citizens of the sovok performed various obligatory rituals (such as participating in uncontested elections of so-called people’s deputies) and had, in one way or another, to approve of anything the authorities did and never complain about their miserable lives. This word entered Russian teen slang in the 1980s and was used to describe a kind of gathering where one could freely come and socialize with other people who shared common interests and led a similar lifestyle. The word derived from the Russian verb tasovat (“to shuffle playing cards”), meaning that at a tusovka you came into contact with different people, including strangers, and these acquaintances were numerous and random in nature (e.g. a tusovka at a disco). 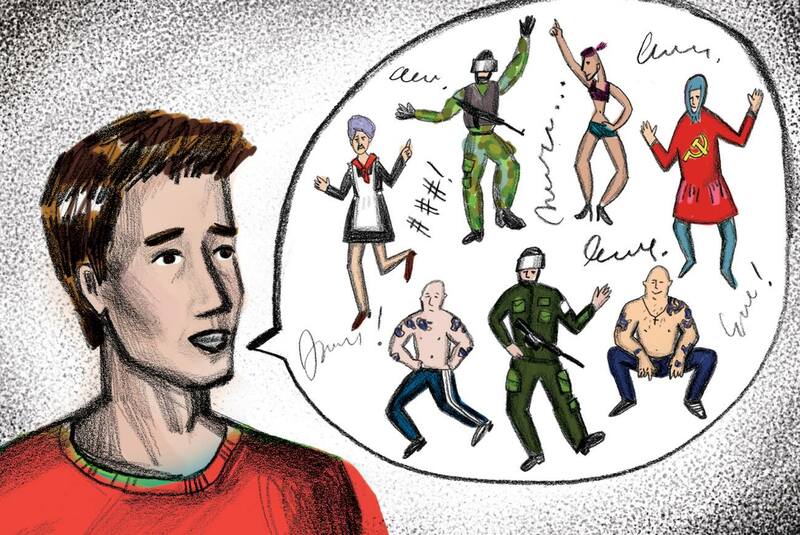 Later, the meaning of the word expanded, and tusovka came to describe not just parties in real life, but also virtual social communities united by some characteristic, be it professional or ideological. Over time, this has become the primary meaning of the word. In artistic circles, there is a widely held opinion that in order to become successful an author must belong to an influential literary or artistic tusovka. The word tusovka can also be applied to various political movements, e.g. the "liberal tusovka" is often contrasted with the "patriotic tusovka." This word — “notions” or “rules” in English — Is most often used in the phrase "to live by ponyatiya." The term originated in the criminal underworld and denotes a kind of alternative set of laws. Criminals who have rejected and violated state laws are said to adhere to rather strict rules of conduct within their own community. Ponyatiya is a kind of informal ethics system based on notions about a particular kind of justice and mutual respect (for example, it is strictly forbidden to deceive or do wrong by "one’s own"). Importantly, ponyatiya only has to be followed within one’s own community. In this respect, the criminal world is a closed social system. The sharp rise of crime in Russia in the 1990s led to criminal slang, which had previously occupied a rather marginal linguistic space, being used more widely. The phrase "to live by ponyatiya" moved beyond a particular social group and took a more general meaning of "to live by unwritten but generally accepted laws, which allow the violation of state laws so long as it does no harm to one’s community." This Russian term is close to the English words “lawlessness” and “arbitrariness.” However, bespredel indicates a complete rejection of any and all rules, be they official legal regulations or informal ponyatiya. A person who behaves in this manner is called a bespredelshchik. This word also has its origins in the criminal world and was originally used in prisons and camps, with the term bespredelshchik used to denote both prison inmates and prison staff.